Corrected the spelling of Cpl Vernon Ingram's name. Added: 2nd Lt Urban F. Thinnes to the Crew Honor Roll. Added: Dedication page for Laurence B. Leinbach, courtesy of his daughter in-law. Found Foster and Fowlkes listed on the Social Security Death Index; No information on any other members of the crew has been found at this time. We received an email from Mark Erickson, grandson of F/O Birdell Brellenthin, FE, He notified us that his grandfather and 2nd Lt Edward Rompspert, AC; 2nd Lt Lyman Benson, Pilot, 2nd Lt Urban Thinnes, Bomb; 2nd Lt Earl Diven, Nav and 1st Lt Leon Janky, Flight Engineer were members of this replacement crew; He goes on to say "they flew one mission and the war ended." Previously through an internet search we found Leon J. Janky listed on the Social Security Death Index (SSDI) this entry does fall into the range of a WWII veteran and given the uniqueness of his last name - it appeared this is the same person - Burly Brellenthin comfirms Janky is desceased. In making contact with Brellenthin and searching for other members of his crew we found an obituary for 2nd Lt. Lyman G. Benson. Records confirm this is the correct (Lyman) Benson. The names of these men were found on 61st BS Roster dated Sept 1945 but we didn't know if they were part of an aircrew or ground personnel since they arrived late in the war until now. The Romspert Crew did their B-29 Phase Training at Davis Monthan afterwards were sent via rail to Kearney Army Air Field, Neb. then onto Hamilton Field, CA. 30 July 1945 for shipment overseas to Guam. Per SO 186, HQ 314th BW dated 8 August 1945 par 14 the Romspert Crew arrived on Guam 7 August 1945 and were assigned to the 39th Bomb Group (VH). 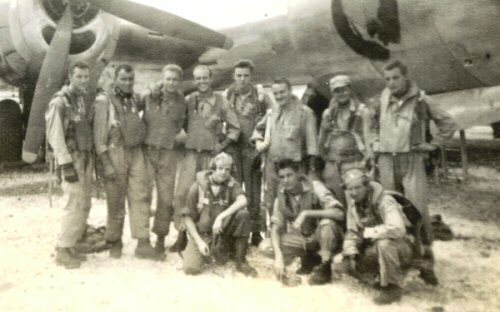 According to Birdell Brellenthin, Radar Observer, he and his crew flew 1 mission - A POW Supply Drop on 30 August 1945 - 17 hours; Earl Diven, Navigator, "We flew several Recon Missions over Japan before the peace was signed. Flew most Recon Missions out of Iwo Jima Base, Later flew some mail trips to Manila. (Burly) Bellenthin has been in contact with Earl Diven as recent as Aug 2004; With Janky in 1947; There has been no contact with any of the enlisted men of the crew.